Easter changes everything. Easter gives meaning to life, tells us who we are and why we are here. Easter explains why others hurt us and what God has done about it. Easter endows the present and future with inexplicable joy. But not everyone who knows about Easter gets this. Her life was marked by pain. How could she trust God after what she had been through? God hadn’t protected her. God hadn’t met her needs. Now pain defined who she was. She would reach for anyone or anything that might ease the pain, pushing away whatever got in the way. She made wrong assumptions about love – love in general and God’s love specifically. She equated love with feelings and circumstances. If it didn’t look or feel like love, it must not be love. How could God possibly show the depth of his love for her? What could he do to change her identity, who she was at the core, so that she was no longer defined by her pain, but by his love? Good Friday, Jesus’ death on the cross, is the answer to that question. God loves us so deeply that he became a man and died for us. But God didn’t stop there. Jesus rose from the dead and that’s why Easter changes everything! If Jesus is alive then God’s demonstration of love is more than an historical event. If Easter is true, God’s love trumps pain, does not waiver with circumstances, is not dictated by feelings. His love is an ever present reality. He defines who we are, not pain, not circumstances, not feelings. I wrote this Good Friday song with her in mind. But she moved away before I had the chance to share it with her. From the album “Main Street – Songs for Today” this video is scrolling playback of the song. 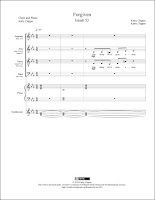 You can get Forgiven print (PDF) and/or digital (MusicXML™) sheet music for SATB choir. Did Jesus rise from the dead? Or was his body stolen by his disciples? Risen, the movie, is a depiction of events surrounding Christ’s missing body after his crucifixion through the eyes of a nonbeliever. I hope you get a chance to see it. Click here for the trailer. Click here for the trailer.